1. Wheat Grass has been determined to be one of the most beneficial nutritional supplements ever developed. Supplementing with Wheat Grass may improve energy levels, strengthen the immune system, and reduce the likelihood of certain types of cancer. 2. But most impressively, Wheat Grass contains nearly all the vitamins, mineral, and nutrients a body needs to maintain good health. 3. Wheat Grass is one of those rare foods, which can supply the human body with practically every nutrient necessary for life. Wheat Grass is also rich in anti-oxidants, and may have anti-cancer properties. Supplementing with Wheat Grass, a safe and natural alternative to mass-produced vitamins, can boost your energy levels, and improve the function of your immune system. Wheatgrass is promoted to treat a number of conditions including the common cold, coughs, bronchitis, fevers, infections, and inflammation of the mouth and throat. 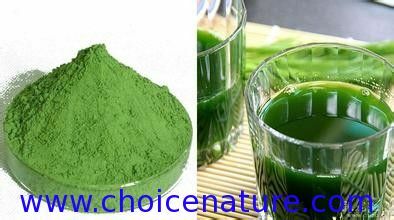 Wheatgrass used to treat cystitis, gout, rheumatic pain, chronic skin disorders, and constipation. Wheatgrass stimulates metabolism and the body’s enzyme systems by enriching the blood. It helps in throwing the toxins from the body and helps in boosting the cell regeneration. Sweetens the breath and firms up and tightens gums. Just gargle with the wheat grass juice. Wheat grass used in treatment of cancer therapy. Used for increasing production of hemoglobin.